Ice tea is simply tea that has been chilled, and nothing beats the feeling of coming home after work, tired and thirsty only to find a glass of an already made fruit ﻿﻿flavored, or coffee Ice tea to quench your thirst and calm your nerves. But having an ice tea maker takes the feeling of drinking chilled tea to a whole new level. Reason being, it takes you a couple of minutes to make your ice tea, provided you got all the ingredients with you. What is an Ice Tea Maker? An ﻿﻿i﻿ce tea maker is an electrical device that is used to automate the making of chilled or ice tea. Its resemblance with the usual electric kettle is about 30% similar, but the ice tea maker has a bit of more extensions. Having an ice tea maker in our homes means that we don't have to boil water and put in coffee bags anymore because it does all that by a single press of a button. An ice tea maker is not a complicated device the way other people think. It is made of a calibrated pitcher with a lid, a removable brew basket located inside the maker, a reservoir lid that covers the ice tea maker and a power cord. A pitcher has two main calibrated parts. The first point is the fresh water caliber cord. This is the point where you are supposed to pour a certain amount of fresh water. The second point shows you where the ice cubes are supposed to reach. The pitcher lid comes in handy once you have your water and ice cubes in the pitcher and you have attached the open outlet with the water reservoir. The brew basket looks like a plastic cup that is used to hold the tea bags. It contains a handle that can be hooked on the side of the water reservoir. The reservoir lid covers the water inside the reservoir and the brew basket. Outside the reservoir is an analog setting that can be used as a regulator for your brew strength selection. All of these components make up the ice tea maker and following the right steps when using it will produce the best ice tea ever. Ice tea makers come in various shapes and sizes. The standard ice tea maker has the above components, but the integration varies now depending on different manufacturers and brands. An ice tea maker is a lifesaver and a time saver. Imagine it is summer and you are tired and thirsty. All you need is an ice tea to quench that thirst, and you will be good. But the process of making your hot tea first then putting it in a freezer to cool and finally adding ice cubes and flavor so that you can drink takes a long time. Using an ice tea maker is way quicker than the manual methods. Once you have tea in the filter and ice in the pitcher, all you need to do is press the power button, and the rest will be taken care of by the ice tea maker. An ice tea maker quantifies ingredients, unlike the manual method where you will not know what amount of water or ice cube is required to make the ice tea. The pitcher in the ice tea maker is calibrated with marked points of the required amount of water and ice cubes. So using it will ensure that there is absolutely no wastage. Make sure you are keen on the water line and the ice cube line because it tells you the exact amount of these ingredients to use. Put fresh water in the pitcher up to the required water line. Put your tea bags in the brew basket. Turn the brew control to your desired brew type in terms of strength. Remove the brew basket and empty the water from the pitcher into the reservoir. Put the ice cubes into the pitcher up to the required ice cube line. Add the flavors and sugar to the pitcher with the ice cube and cover it with the pitcher lid and put it directly under the brew strength knob. Press the power button and wait for a while. Mr coffee started with manufacturing coffee making products before venturing into the business of ice tea makers, and they proved to be good at it because their products designs are magnificent and of high quality than most of its competitors in the market. Mr. Coffee FTM70W Fresh Iced Tea Maker features a pitcher a reservoir with a brew strength knob and a filter in case you are using loose tea instead of tea bags to brew your iced tea. The best thing about this ice tea maker is that you can brew your iced tea in a matter of 9 minutes at most and after doing so you won't need to manually wash the ice tea maker because it is dishwasher friendly. The pitcher is also replaceable. The design of the Mr. Coffee BVMC-TM33 is quite out of this place with the pitcher comfortably fitting inside the brewing reservoir making it a 2 in 1 ice tea maker and small to take up the least of your kitchen counter space. You will never hear of cases of spillage when using this kind of an ice tea maker. The pitcher is big enough to brew 2.5 quarts compared to other ice tea maker brands whose highest brewing quarts is 2. 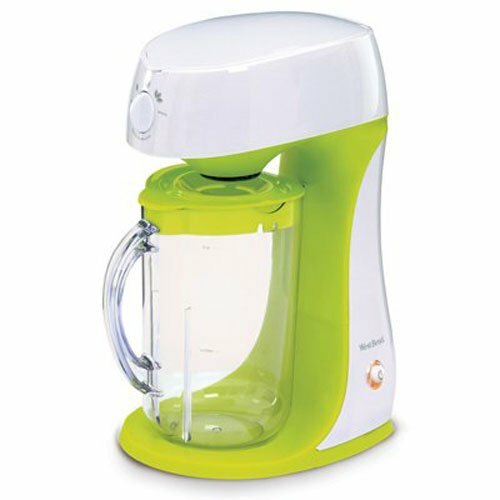 It has a removable filter basket which can easily be cleaned, so you won't need filter papers when using this ice tea maker. The reservoir automatically goes off once the brewing is done in a matter of minutes. Mr. Coffee BVMC-TM33 also features a brew strength setting which you can choose how strong your ice tea will be. It has an easy to clean glass pitcher with a strain resistant ability. This ice tea maker is the best when it comes to retaining the taste and purity of your ice cold tea. 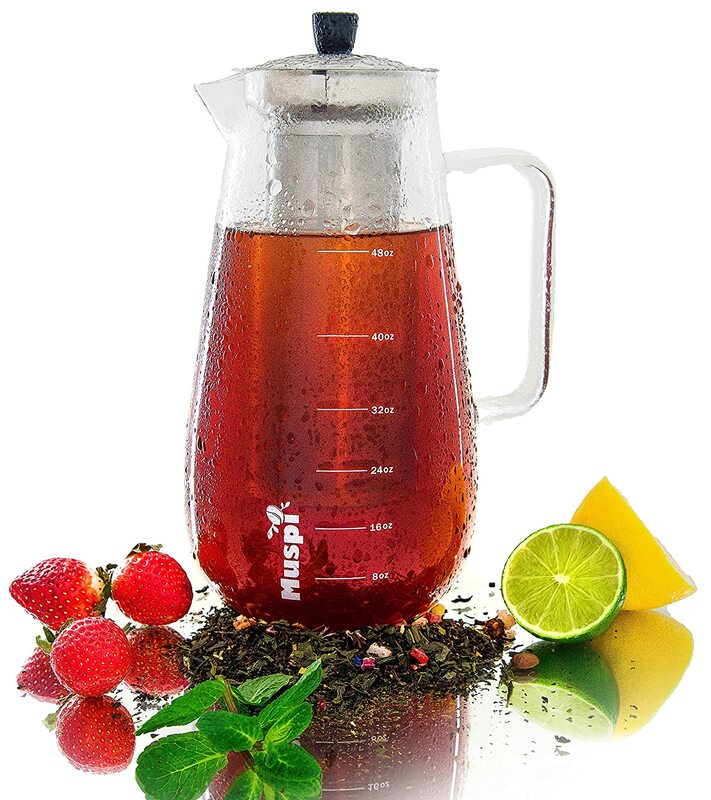 The Cold Brew Coffee Maker and Iced Tea Infuser by Muspi are manufactured using BPA free materials that are food safe. If you are using this ice tea maker to make a cold ice coffee tea, it will retain all the tint of bitterness and sweetness from the coffee and the flavor. It features a filter that is of high-quality stainless steel which prevents water from getting mixed up with your ground coffee thus ensuring that the coffee you will be brewing will be of high quality and cold. The best thing about cold brewing is that there is less acidic taste than the hot type. This means that what you will be sipping out of that cup of coffee will be nothing but a strong coffee concentrated with all the flavors. 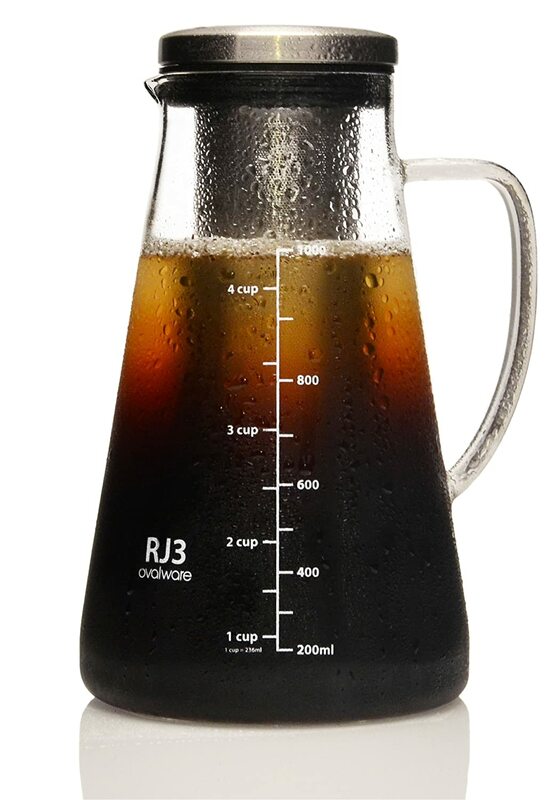 Airtight Cold Brew Iced Coffee Maker and Tea Infuser features a borosilicate glass that works quite well at any temperatures without easy breakage, a rust resistant filter and cap made of stainless steel and it is small enough to fit inside a refrigerator. 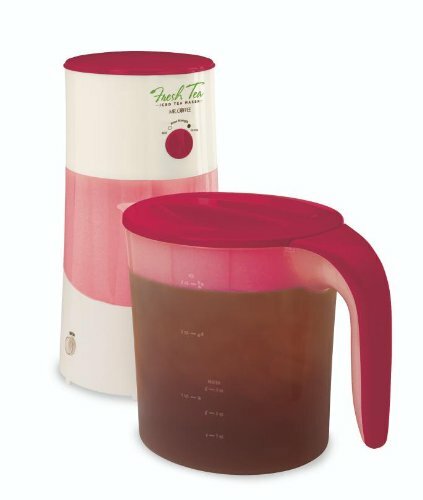 The design of West Bend 68305T Iced Tea Maker is cool. It has a plastic pitcher that can make up to 2.75 quarts and a removable brew basket with a filter that can accommodate both the tea bag and the loose tea. It also has an option to sweeten your tea. It features an indicator that tells you whether it is on or off and a brew strength setting. First of all, before you use your purchased ice tea maker, you need to thoroughly wash it. Choosing the right ice tea maker is not hard task once you know whether you like the cold decantation process of making ice tea or the heating process. All of the above makers have a point of inefficiency. 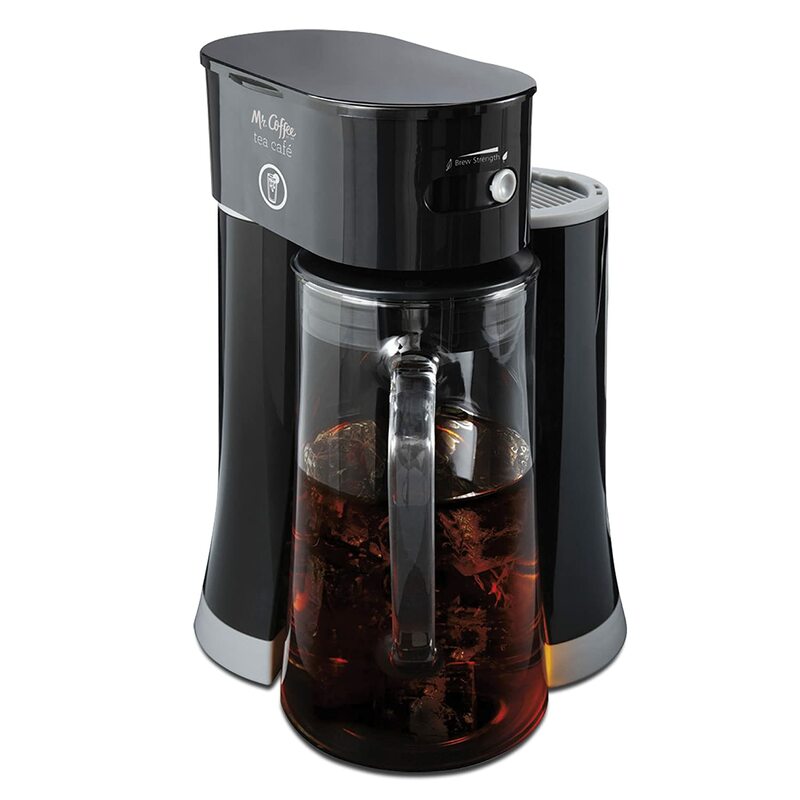 Mr. Coffee BVMC-TM33 seems to come out to be the best ice tea maker despite the easy breaking of the pitcher. The good thing is that it can be replaced.